Anita is described as a browned burgundy. It’s a deep, dark brown with reddish-burgundy undertones. To me this is more brown then burgundy BUT you can definitely see the burgundy in it. It’s incredibly pigmented, and as is par for the formula, a little goes a long way as it always is with Lip tars. If you've never had a lip tar, they do have a minty smell, but it's faint. It does smell really nice, so it's not something that you have to be overly worried about. I found that with this lip tar, it did seem a little thin to me, but it isn't a problem at all. I do advise though that you shouldn't forget to line your lips with at least a CLEAR lip liner or something. Now since I don't have a lip liner I usually don't wear this because it feathers on me like no other. I do wear this when I wear foundation and I use my concealer to line the edges of my lips to help kind of deter Anita from snaking it's way into the fine lines that I have. Anita is such a gorgeous color and while it's not my "go-to" I have found myself wearing it quite a bit in the recent weeks. You can wear this where it's not too dark and I will show you what that looks like down below! This was my first ever product from OCC and it made me fall head over heels in love with the brand! If you are blessed with your Sephora carrying these you can find them in store (mine doesn't boo) you can find them on Sephora.com or you can find it on OCC's Website HERE. The Lip Tars retail for $18.00 USD for 0.33OZ | 10 mL. This was provided by OCC via The Makeup Show Orlando in 2013. All opinions are my own. 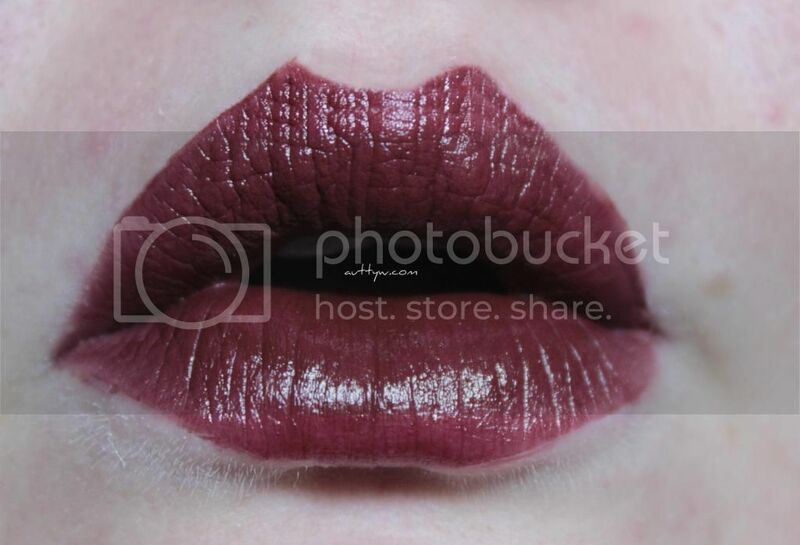 What a deep and vampy color this is! I would be afraid to wear it too heavily but lightly applied on the lips, its gorgeous. Its a pretty berry stain. i really want to try lip tars!